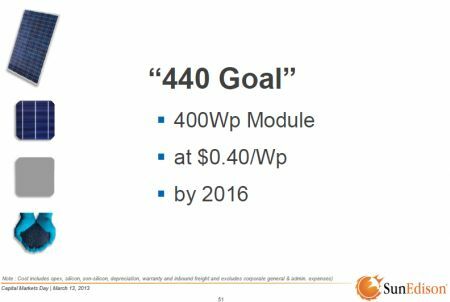 SunEdison wants to be the lowest-cost module manufacturer in the world at 40 cents per watt for a 20% efficient module in 2016. How is this possible? On March 13 of this year, SunEdison (then still known as MEMC) held its annual Capital Markets Day, where it laid out key aspects of its business outlook to investors and analysts. Nestled amidst the avalanche of slides were some very interesting disclosures related to SunEdison’s module technology roadmap -- specifically, its medium-term targets for module costs and conversion efficiencies. As shown in the figure below, the company is targeting an all-in module cost of $0.40/W, along with a power rating of 400 watts, by 2016. To put these targets in context, consider that SunEdison’s module cost in 2012 was 67 cents per watt, implying a planned reduction of over 40 percent from 2012 to 2016. Considering that prices for key module materials like polysilicon, glass, frame and encapsulants are widely expected to level off following a painful and protracted period of compression in 2011 and 2012, and that consumables price reductions contributed around 80 percent of the cost declines we saw from 2010 to 2012, it’s fair to say this is an aggressive target. 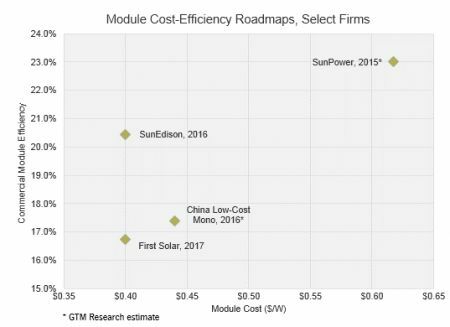 Just how low SunEdison is planning to go becomes all the more clear when its module cost target is compared to GTM Research’s base case estimate of $0.38 per watt for industry-leading Chinese producers in 2016. The comparison isn’t apples-to-apples, as SunEdison’s target includes non-manufacturing costs such as selling expenses, warranty, and inbound freight, which would contribute $0.06-$0.10 per watt. In other words, SunEdison is shooting for a “core” manufacturing cost (defined as depreciation of property/plant/equipment costs, materials, direct labor and utilities) of $0.30-0.35 pr watt by 2016 -- which is comfortably below our estimate for Chinese producers, and would likely position SunEdison as the lowest-cost module manufacturer in the world. 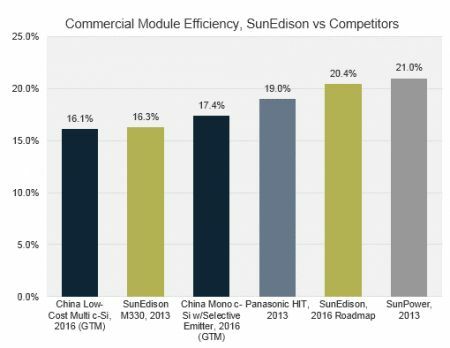 If SunEdison’s module cost target seems ambitious, its conversion efficiency roadmap is likely to turn even more heads. Assuming a 72-cell module, its 2016 power rating target of 400 watts translates to a conversion efficiency of around 20.4 percent. This compares to a mean efficiency of 16.3 percent for the firm’s Silvantis monocrystalline module at present and implies an average increase of almost 1.5 percent per year for the next few years -- almost eight times higher than the historical rate of improvement for crystalline silicon technology in recent years (roughly 0.2 percent per year). At this level, SunEdison would be placed far ahead of both multi and mono c-Si Chinese fleet efficiencies -- even assuming, as GTM does, that the Chinese mono line incorporates a selective emitter platform at that point. In fact, a more appropriate comparison would be with industry leaders in efficiency such as SunPower, Silevo and Panasonic, all of which use highly proprietary IP to drive efficiency gains above and beyond the mostly commoditized technology of the mass market. However, there is a very important difference between SunEdison’s roadmap and those of efficiency leaders like SunPower and Panasonic, and this is where things get interesting. Step-function efficiency increases generally come at the expense of additional costs, be it through additional capital investment, a bigger or more expensive bill of materials, more process steps, or lower manufacturing yields. SunPower and Panasonic, for example, have amongst the highest module cost structures in the industry. SunEdison, on the other hand, is aiming for a cost structure below that even of the lowest-cost Chinese firms. The chart below, which plots efficiency against manufacturing cost for different firms’ roadmaps, illustrates just how aspirational SunEdison’s goals are. As shown, if the company were to realize its 2016 targets, it would be uniquely positioned on the module landscape -- close to industry-leading efficiency at industry-leading cost. This is the long-sought-after holy grail of PV module manufacturing, and countless startups have perished in its pursuit. So just how does SunEdison plan to reach these far-reaching targets? At the outset, it seems clear that the company plans to focus exclusively on monocrystalline silicon technology, which stands in sharp contrast to the path followed by the Chinese in recent years. Multiple Chinese firms have noted that mono c-Si has taken a backseat to multi c-Si in terms of production volumes and additional capacity planning, for the simple reason that it remains more expensive to manufacture while at the same time offering a lower efficiency premium than multi c-Si in years past. In large part, this is due to the emergence of what some in the industry are now calling “high-performance” multi c-Si technology (currently 17.4-17.8 percent cell efficiency): a combination of higher amounts of virgin silicon, more finely graduated temperature control during ingot growth, and central sorting of ingots (using the central nine ingots instead of sixteen, and throwing the rest back into the mix). So while mono c-Si is a fairly straightforward selection in terms of driving high efficiency, it is slightly counterintuitive as a low-cost technology of choice. Electronic-grade FBR Polysilicon: Along with Samsung Fine Chemicals, SunEdison is joint owner of a 10,000-metric-ton polysilicon plant currently under construction in South Korea. 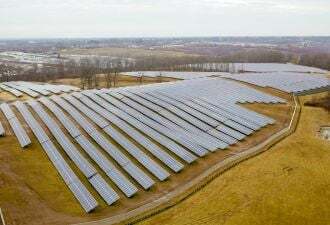 The plant will utilize SunEdison’s proprietary Fluidized Bed Reactor (FBR) technology, which uses as much as 90 percent less energy than the currently dominant Siemens process. When fully ramped, the Korean plant is expected to produce electronic-grade silicon (a purity higher than solar-grade silicon and therefore driving higher efficiency) at an all-in cost of less than $15 per kilogram. 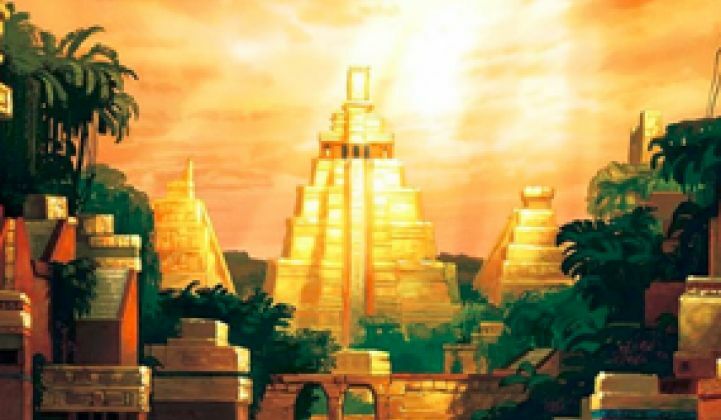 Continuous Czochralski Ingot Growth: Through its acquisition of American ingot producer Solaicx in 2010, SunEdison owns proprietary technology related to ingot fabrication that drives both lower processing costs and higher cell efficiency. Known as the Continuous Czochralski (CCZ) Process, the technique involves continuously replenishing the feedstock melt, as opposed to the traditional batch process for growing mono c-Si ingots. In addition to reducing processing costs due to higher throughput and lower feedstock losses, the process also drives higher efficiencies due to a more uniform level of doping across the ingot’s length. Diamond Wire Wafering: Using diamond-coated wires to slice ingots into wafers instead of the standard steel variety can increase throughput by a factor of two to three, requires no slurry, and reduces kerf (sawing) loss. 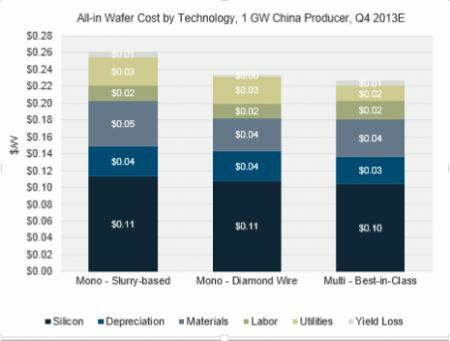 As shown in the chart below, GTM Research estimates diamond wire wafering can drive reductions of roughly 12 percent in all-in wafer costs. Local Module Assembly: SunEdison plans to use local contract manufacturers located near the relevant end-market for module assembly, which will reduce shipping costs. Additionally, it may utilize the services of lower-tier Chinese module producers, which would allow it to leverage China’s large-scale and low-cost consumables supply chain (the main reason for the cost disparity between China and other PV manufacturing regions). N-Type Technology: The Secret Ingredient? The strategies and tactics discussed above will certainly help SunEdison continue lowering costs and increasing efficiencies. But taken together, it is doubtful that they would suffice to create the disruptive combination of cost and efficiency that the company aspires to; in fact, most of the above-discussed innovations are already incorporated into SunEdison’s current manufacturing processes, making it difficult to see how they could drive anything more than incremental benefits going forward. This is particularly obvious on the efficiency front: there are few (if any) roadmaps for p-type mono c-Si that target module efficiencies north of 19 percent. This leads one to suspect that there must be a key component to SunEdison’s technology roadmap that the firm has not yet disclosed, most likely a planned transition to a non-standard cell architecture. Although in theory there are many possible candidates, one concept stands out as the most likely suspect: n-type monocrystalline technology. It is noteworthy that every single firm that is commercializing high-efficiency single-junction technology (which I define as higher than 18 percent at the module level) -- SunPower, Panasonic, Silevo, Solexel, Sunpreme, TetraSun -- uses an n-type base coupled with other advanced technology concepts (e.g., back-contact, HIT, tunneling junction). Unlike the current industry-standard p-type cells, where the majority dopant is boron, n-type cells have phosphorus (an n-type carrier) as the majority dopant, with the p-type dopant (usually boron) being introduced at the cell processing step as the minority charge carrier. The rub is that while the production process for n-type is currently more exacting and costly than p-type, it has a proven track record at both the research and commercial level of achieving cell efficiencies in excess of 20 percent. Given SunEdison’s already public commitment to mono c-Si, the intrinsic efficiency limitations of p-type mono and n-type’s popularity amongst SunEdison’s high-efficiency competitors, it seems a reasonable conjecture that n-type mono technology is the secret ingredient in SunEdison’s ambitious module roadmap. The Path to N-type Technology Development: Is Silevo the Silver Bullet? So if n-type is so central to SunEdison’s module roadmap, why hasn’t it merited a mention so far? 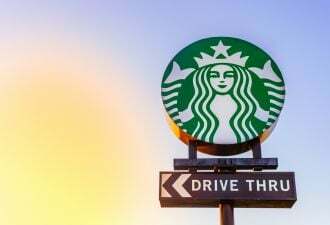 My guess is that the company hasn’t yet finalized the details -- specifically, how exactly the technology will be developed and commercialized. SunEdison does not own any patents related to n-type technology, meaning that R&D capabilities would have to be developed either internally through key hires, or via an acquisition. Given the wealth of challenges associated with n-type technology and SunEdison’s prior history of acquisitions, I would suggest the latter possibility is more likely, and in terms of potential targets, California-based Silevo is an obvious suspect. The two companies reportedly collaborated closely on the development of Silevo’s recently launched 72-cell Triex module, where SunEdison supplied Silevo with n-type wafers. Moreover, both of SunEdison’s American competitors have aligned themselves with other promising low-cost/high-efficiency startups -- SunPower with Solexel, and First Solar with TetraSun, leaving a dearth of qualified applicants for the job. Silevo already has a 17.8 percent module on the market at a surprisingly low cost structure considering its current small scale (it makes its cells in China and outsources module assembly), and my conversations with company management left a promising impression. Of course, a direct acquisition is by no means the only possible outcome: SunEdison could also gain access to Silevo’s technology through a joint venture, strategic investment, or technology partnership as well. The challenges associated with developing a truly low-cost, high-efficiency n-type technology should not be underestimated -- just ask SunPower and Panasonic, which have both struggled to maintain any semblance of cost parity with the Chinese herd over the years. But given SunEdison’s experience with high-volume manufacturing, its existing suite of technology IP, and flexible business model, I believe it has a very real chance of bucking the trend and creating history. Under the leadership of CEO Ahmad Chatila, the company has consistently exhibited a willingness to make bold and forward-thinking bets with its strategic direction and business model, the most obvious example being its acquisition of what was then a mid-size U.S. project developer back in 2009. If speculation about its adoption of n-type technology turns out to be correct, this would be another addition to that list, and watching this story unfold will make for fascinating viewing. Shyam Mehta is a Senior Analyst at GTM Research and author of the recently published report PV Technology and Cost Outlook, 2013-2017.